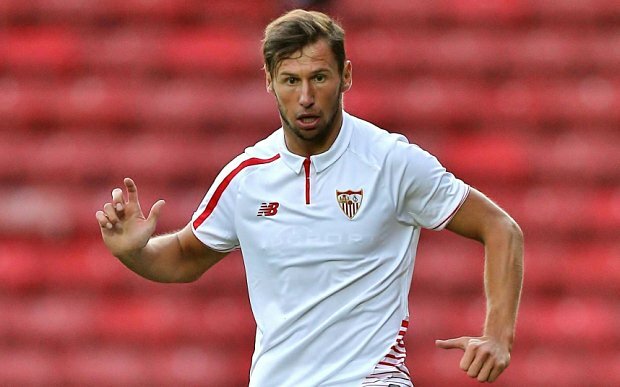 Barcelona are interested in signing Sevilla midfielder Grzegorz Krychowiak this summer according to reports from Catalan newspaper Mundo Deportivo who said Barça have reached out the player’s representative and may make a bid soon. The report claim Barça contacted the player’s representatives two weeks ago, before the Copa final to enquire about his contract situation has rumours have linked the player with a move away from Sanchez Pizjuan. However, Mundo Deportivo also made it known that Sevilla are yet to be contacted by Barça about the player who joined them from Reims in the summer of 2014. The player has a release clause of €45 million and Sevilla might want to cash in on him for that amount which is ten times the amount (€4.5 million) they paid for him in 2014. Krychowiak is a defensive midfielder which means he’ll have to battle it out with Sergio Busquets if he joins Barça, but Busquets seem indisputable in that position and has just agreed a new 5+2 years contract. With Mascherano leaving, it will mean Krychowiak will be Barça’s second choice Defensive Midfielder if he joins, it is very unlikely to happen.